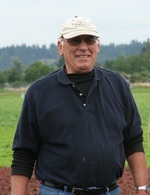 Long time Valley farmer and former Fife City Councilman Jack Sterino passed away peacefully in his home on Wednesday, August 16th. Jack is survived by his long time life partner Ann Stewart; daughter, Nicole (Patricio), son, Jake (Karyn), sister, Anita Sterino and six grandchildren; Gavin, Edgar, Cameron, Vince, Alondra and Haeli. A Funeral Mass will be celebrated on Friday, August 25, 2017, at 11:00 a.m. at St. Martin of Tours Catholic Church. The Rosary will be recited prior to mass at 10:30 am. Interment at Calvary Cemetery. In lieu of flowers, please make donations to Bellarmine Preparatory School.